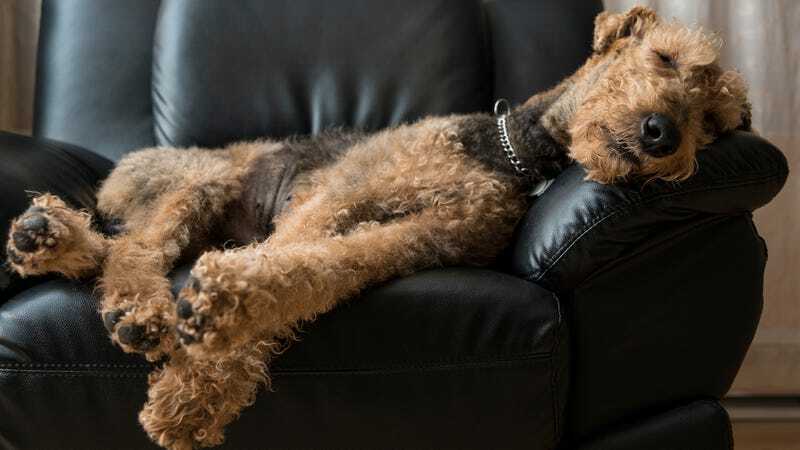 ITHACA, NY—A study released Monday by animal behaviorists at Cornell University found that dogs that twitch, move their paws repeatedly, or growl in their sleep are, in fact, dreaming vividly about tearing their owners limb from limb. “After thousands of hours of observation, we are forced to conclude that any dog witnessed making even the slightest of movements in its sleep is living out a cathartic vision of absolutely mauling their owners,” said lead researcher Dr. Hana Michaels, adding that any dog, regardless of breed, size, gender, or degree of training, was visualizing the act of devouring its master if observed fidgeting even the slightest bit while sleeping. “Many dogs will suddenly jerk their bodies as if they’ve been startled in their sleep; in fact, they’re seeing themselves pawing your face off, sinking their teeth into your neck, and feeling the hot gush of your life’s blood against the backs of their throats. It seems the faster they churn their little legs while curled up on their beds or favorite spots on the couch, the more intent they are about chewing off all your extremities and rooting around in your chest cavity. The quiet whimpers that you think are so sweet are actually coded pack signals calling all other canines in the neighborhood to come and satiate themselves upon your organs.” At press time, Michaels added that owners should be concerned if they see their dog licking themselves, as it may be an indicator that their pet has already slaughtered several victims and is meticulously cleaning blood from its fur.